My back has a natural V shape to it and I’ve got pretty developped lats. Add to that the fact that I’m not too tall and have a shorter torso, so that the V is more dramatic than in a taller person. To illustrate that, the infamous Victoria Secret fitting style would put me in a 40 band, as my overbust is not 4, not 5, not 6, but a whole 8 inches larger than my underbust. With an underbust of 32 inches. The +4 method would put me in a 36 band, the +0 in a 32. Yet, I find that a 34 is usually the best fit. My guess is that it is due to my back shape. While some 32 work great (Hello, Oriental Bloom! 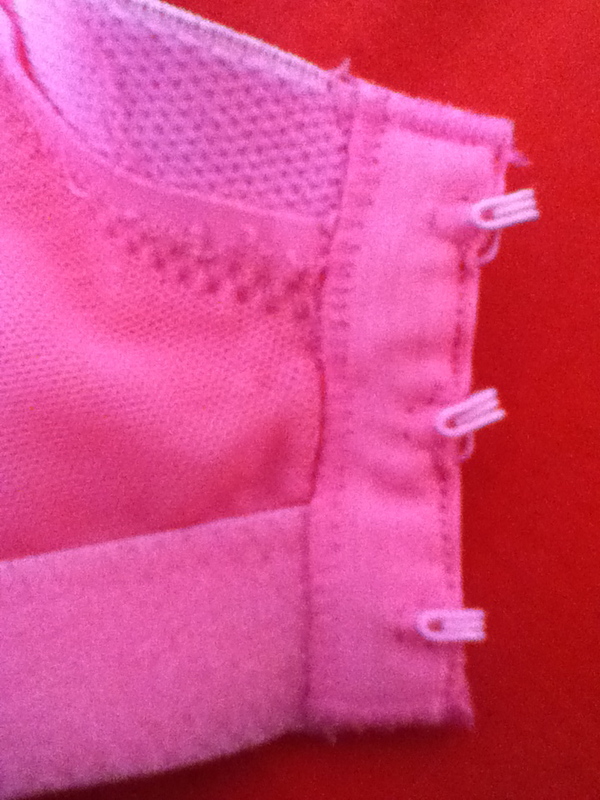 ), with most, I find that the lowest hook and eye closes easily, but the top one is pulled to tight. First two pics are Panache Harmony, third one is Bravissimo Alana. 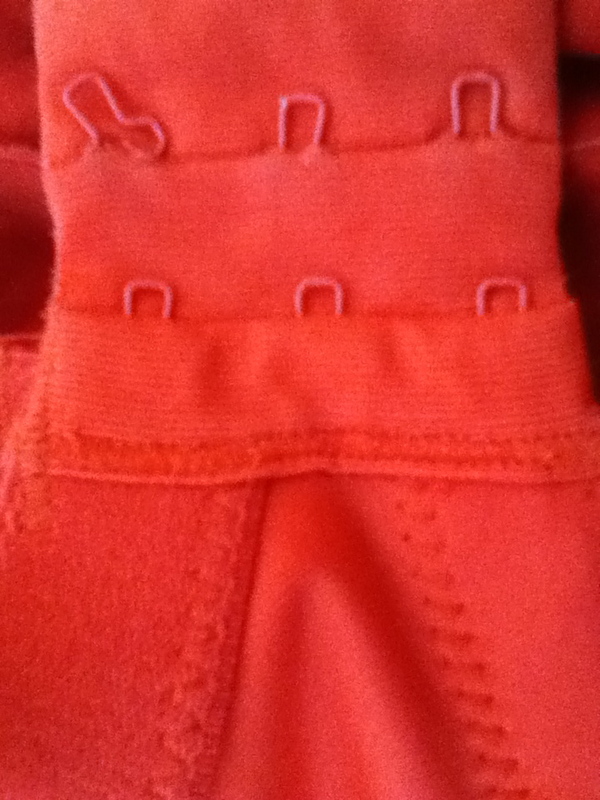 As you can see from the third pic, the eye of my bra was pulled so tight that it actually fell off! Ideally, I would need a 32 on bottom and a 34 on top! For now, I just make sure to try bras in both sizes and check which one fits best. I wonder if any manufacturer takes into account the fact that the back is wider than the underbust for many women and if there are some bras more suited to that back shape than others. 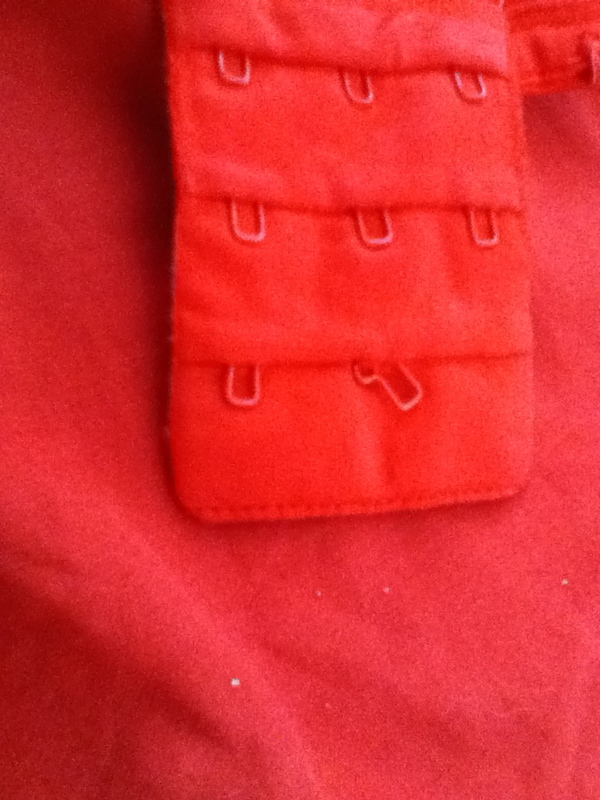 This entry was posted in Uncategorized and tagged back, band size, body shape, bra fitting. Bookmark the permalink. Yes, I’ve always thought I couldn’t be the only one as I see plenty of other women with a similar back shape, it’s not like I’m built like a she-hulk! I have sold them on already, but bought some Kris Liine bras early this year that were cut wider at the top of the band than at the bottom. That’s good to know! Did you sell them because they didn’t fit? I’ve read they’re cut one cup size smaller. Yes, I ordered my normal UK size and they were too small, so I sold them on to smaller people. They are cut way more than one cup size smaller, and the bands are small as well. I think they are one bra brand where you should maybe go up at least a few band sizes, and stay the same letter size. So, I am a 34GG, but I would order a 38GG from them if I order again. The sizing is that crazy! They were very pretty, I was so sad they did not fit!